OKIFOLKI: Sea Bowls. And A Confession. Sea Bowls. And A Confession. Bah! I've had such a rubbish time lately. (Cue violins.) I suffer from Hypermobility Syndrome (HMS) and Fibromyalgia. I have tried to keep this part of my life away from my blog, but I always end up leaving huge gaps where I don't post anything at all, so I've had a re-think and decided to scrap that idea and tell it all anyway. HMS is a condition where basically your ligaments don't work properly. Where they ought to hold your bones together, in HMS sufferers they're too lax so your joints are prone to dislocation and sublaxing. Whenever I explain this to people they usually say 'Ooh, sounds painful!'. It is. Sometimes I'm not so bad, but other times, like this week for example, I'm stuck on the sofa or my bed unable to move, drugged up to the eyeballs and in a lot of pain. Fibromyalgia is a condition where you suffer from pain in the joints and muscles and chronic fatigue. Many of my fibro and HMS symptoms cross over and apply to both conditions. So there you have it. As I say, I've tried to keep all this out of my blog because I've read that it's not good for business; that I should keep my blog relevant to what I sell and interests around that and not be always moaning about my ailments as it puts readers off. I must say I have no intentions of always whingeing and banging on about it. But these conditions have a huge impact on my life and to have to avoid speaking about them often makes me feel like I can't be myself. And if being myself puts people off, well that's a risk I'm prepared to take. 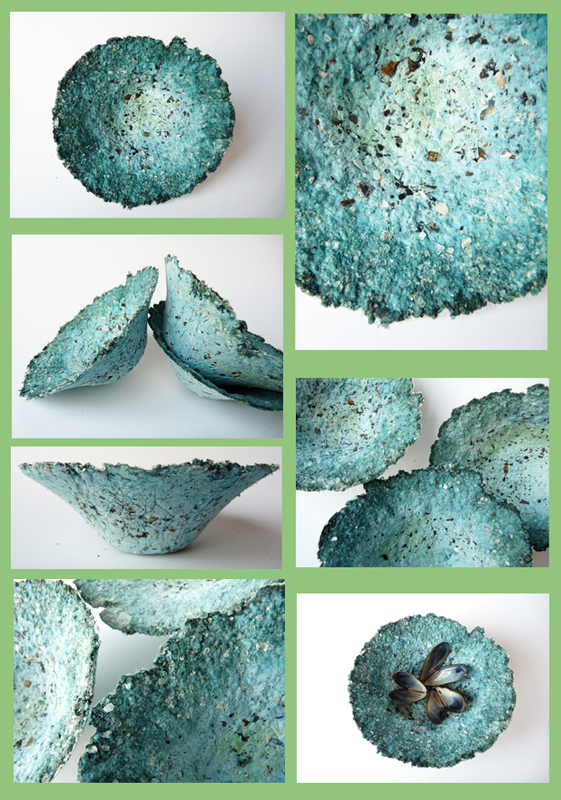 I have included crushed mussel shells in the paper pulp mixture and added sea salt crystals around the rims of the bowls. These two ingredients have made for a much thicker and sturdier bowl than usual and this has inspired me to try some new recipes. Originally I made my bowls with the intention of people using them as offering bowls - burning them, burying them or setting them out to sea etc. But it would seem that more and more of my buyers want to keep them, so I'm going to experiment with some different ingredients to try and make them more durable and robust. I'll let you know how it goes. I'm also trying to make some little spell-bombs from paper pulp. My first attempt failed miserably, but I'm going to keep trying as I think they'll be a really cool addition to my shop as they'll be a much lower price entry for those with not much money to spare (... that'll be just about everyone then! lol). I'm trying to get ready now for my first pagan camp of the season and my first ever stall! This will be Beltane At Thornborough near Ripon in Yorkshire. If you're going to be there please do come visit me and say 'Hello!'. Being confined to the sofa all week has really made life very difficult as I'm desperate to get enough stock together for the camp. At this rate there won't be much to sell! Wish me some healing please! And in return I wish you all love, light, luck and laughter! lovely bowls! Such beautiful colours! Sally you sometimes have to be honest about your health as you say if you disappear people will now know why. Love the new bowls. Good luck with your first stall.